In a technology-rich utopian picture of industries, where corporate executives have become accustomed to business analytics on demand, the good-guy 'manufacturing' remains a blind spot. More so, the unique nature of manufacturing data makes it an even bigger challenge to illuminate this blind spot. While corporate leaders have access to enterprise level information for various aspects of their business, manufacturing data is rarely part of it. According to a recent survey by LNS Research, sponsored by Sight Machine, only 14 percent of respondents have a corporate analytics program that uses manufacturing data. To put across a clearer scenario, one machine may output huge amounts of data containing dozens of variables like temperature, press pressure and conveyor speed. That data might need to be associated with specific product batches, and will contain defect rates that might not become clear until the next stage in the production process. Data is often in silos with little or no connection to other corporate data, if it is retained at all, and is difficult to interpret. Besides, behavioural data science is even more applicable in manufacturing industries where people operating the process are an inherent part of any solution. With so much hype around the usage of data science in manufacturing, businesses are often misjudged for their technological unawareness, caught as they are in a whirlpool of solutions with little understanding of their value and applicability to solve their problems. The ability to pick and choose the right solution provider is key. One of the Founders, Shankar Narasimhan, very rightly puts, “Our early engagements with clients focus on evaluating the potential opportunities that data science provides through rigorous ROI calculations. We invest considerable time in the early stages of the project to fully understand and articulate the needs and expectations of the client and develop the solution architecture”. 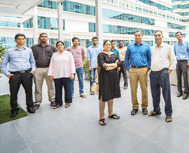 "GDPL algorithms use domain knowledge in appropriate proportions based on the problem being solved"
Based out of Chennai, Gyan Data Private Limited(GDPL) has been offering solutions that intrinsically address the aforementioned challenges by making people also a part of the solution. Problem definition and developing tailor made solutions for specific industry problems, which is different from application of algorithms, is a clear differentiated capability in GDPL a market filled with data analytics solution providers. GDPL calms the agony of agitated and confused business owners with customized bespoke solutions. The company delivers solutions and ongoing support that help manage and sustain data science offerings at the customer end. GDPL’s solutions require higher order cross functional expertise in order to offer end-to-end solutions to the customer. Going by the use-cases the company has worked on, this approach is truly 'unique'. From process operating to planning and scheduling, data is used to support decisions that affect product quality, plant profitability, and plant safety. Thus reliable data is essential to any industrial process. Unfortunately, that’s not the case more than often. Data is often counterfeit and is accompanied by sensor bias and random errors–a primary reason why material and energy balances seldom reconcile in process plants. Data reconciliation helps in this regard by providing reliable estimates of data, irrespective of which domain it is from. As this provides a strong foundation for process analytics work, GDPL uses it extensively when working with manufacturing data. Though GDPL’s solutions have found the best use in the manufacturing domain, the company design the solutions to be domain agnostic. Therefore, besides the manufacturing sector, Gyan Data has also catered to verticals like defence, healthcare, auto, pharma, thermal, finance, logistics, telecom and CRM sectors. The company’s expertise lies in combining first principles modelling and data driven analytics. This allows Gyan Data to offer an expanded repository of solutions. This traction from diverse industry verticals has enabled the company to capture a large part of the market share. In manufacturing, GDPL has experience in continuous, discrete and batch plants. Gyan Data has worked on a real time optimisation project for an oil refinery. The organization’s deliverables in 'soft sensing' and early warning systems met leveraged usage in predictive maintenance, scheduling operations for plants and leakage detection in pipelines. GDPL has put forth solutions for controller performance monitoring and diagnostics engines for process plants as well. Gyan Data’s exceptional production planning and supply-chain or scheduling capabilities have been used for oil, gas and food manufacturing applications. Both Indian and US defence sectors have put to use GDPL’s solutions in the area of efficient energy usage in fuel cell stacks and portable battery packs. These solutions can be leveraged in the automobile sector as well, which is currently witnessing the introduction of electric vehicles. Gyan Data’s engagement with the automobile sector is fairly strong. The company is presently working on problem statements like reliability, logistics, predictive cost models, yield improvement, defect reduction, and ramping up of new product design. Gyan Data’s automation solution for the textile sector reduces footprint and intensifies four sub- processes into one for precise dosing of chemicals and pH control. This is one of the recent projects that showcase GDPL’s capabilities in industrial IoT and digitization. "Gyan Data leverages its proximity to IIT and access to domain experts to address challenging industry problems"
then the physics of the problem will be the matrix into which data science algorithms are woven. If it is a data- based ‘Digital Sensor’ development project, the matrix and the filler will be reversed. Going beyond this, GDPL is also developing a domain agnostic framework for integration of domain knowledge into data science algorithms. This seemingly oxymoronic idea is realized through abstraction of domain knowledge into generic knowledge categories and integration of these knowledge categories with data science algorithms. GDPL’s affordable solutions require leaner processes for developing problem definition and solution architecture. An automated analytics engine that can help GDPL navigate and structure a solution strategy is in the process. “Our experience working on manufacturing projects has revealed the gap that industry needs to navigate to take care of digitisation and availability of well annotated /structured data required for advanced analytics”, informs Lakshmi Vaideeswaran, CEO of the company. Gyan Data is also working on the idea to develop a digital platforming tool that can integrate process industry data and fast track solution delivery. The firm’s experience working with clients has revealed the improvement in quality of the problem statement that enabled them to bring through their initial engagement. Gyan Data has developed significant IP that will be monetised through products and licensed tools in the coming years. Translation of their learning into new geographies, domains and for new clients will see a scaling up of operations and standardizing some tools and processes. The company encourages their clients to enter a partnership in their data science journey and offers training at various levels. More so, the courses cater all the way from those new to data analytics to company executives/decision makers, bringing to them tools, techniques, expectations and understanding of the risks that data science projects can offer. Empowered clients seek higher order solutions. Such clients help develop the ecosystem within organizations to exploit data science effectively. Gyan Data has strategic partnership with some companies that are in the process of developing their Analytics organization. 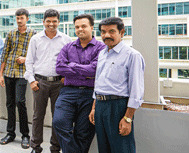 Gyan Data leverages its proximity to IIT and access to domain experts to address challenging industry problems. This also is one of the key reasons why GDPL manages to attract a talent pool of data scientists and engineers from IITs and other premier institutes within India and abroad. The company also has a panel of advisors hailing from both industry and academia who offer technical advice when needed. The industry veterans introduced dynamic management strategies that include fostering creativity, research orientation, and employee freedom. The collective problem solving attitude that has been inculcated has clearly been the key to the company's success. With such sophistication in their application of technology solutions, it is safe to conclude that GDPL has been able to retain the mandate to develop niche, customised, integrated solutions for the Indian industry. Treading along the path of innovation and excellence in data science capabilities, Gyan Data Private Limited offers a promising future to the data driven processes across a wide section of industries. Established in 1984, one of India's leading manufacturers of foundry consumables,MPM Infosoft, primarily known for their proprietary blended, lustrous carbon additive marketed and sold worldwide, wanted to deliver a product for their end-customers (foundries)that helped reduce the number of 'defective' castings reported in their operation. A common approach in engineering practice is to describe every process operation through a first principles model. Such an approach quickly becomes infeasible with the realization that the underlying physics of the entire foundry sand system is ill understood. It immediately follows that a data modeling approach is the only other feasible choice. This too has its own problems in the form of identification of the correct set of inputs to model the system, not to mention the quality of input data. Finally there is the mammoth task of providing a solution which is scalable and configurable across customers, while being easily accessible to even the most in experienced personnel in the foundry. The team of experts at Gyan Data realized that a predictive and prescriptive analytics solution would not only allow foundries to predict the performance of their processes but also recommend process changes that they could implement to meet the overall metrics for their processes. The cloud- based application developed by GDPL sets a global benchmark in foundry solutions allowing customers to be more profitable and agile through the use of advanced analytics solutions. The process of development mandated revamping systems and process used in the foundry industry. We worked closely with end customers to establish measurement systems to standardise data collection practices and bring in the ethic of managing and annotating data before working on developing any solution. The team categorised the sand and casting rejection data into several operational states, each of them resulting in a determinable percentage of casting rejects. GDPL integrated prescriptive capabilities into the model to assist the foundries make decisions on how to correct the process and move it to the desired performance level. The self learning capability of the model helped foundries move away from mere prediction of performance to correcting and bringing in higher degree of agility to adapt to the changes. This effort resulted in development of not only a comprehensive sand characterization protocol but also a flexible yet robust data validation engine. Gyan Data’s knowledge gained through experience in process control and data visualization was also put to use, with the team developing intuitive reporting engines for monitoring and control of sand parameters. In its current iteration Sandman acts as a repository of the experiential knowledge of the foundry, with the ability to record, monitor and perform retrospective analyses on any process operation affecting the sand system. Sandman is currently being deployed across foundries in India. Gyan Data believes in collaborative development and iterative refinement and therefore continues to work with this client in improving Sandman, providing personalized solutions for foundries.